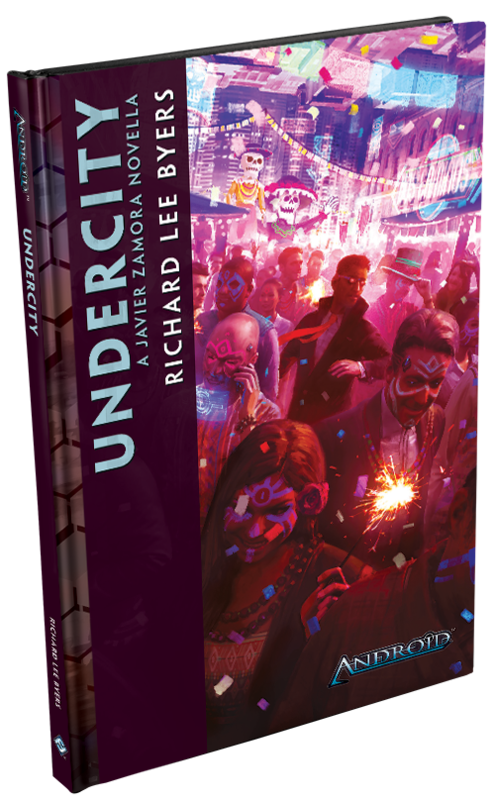 Order your own copy of Undercity at your local retailer or online through our website today! The world changed. Crime did not. While humanity has achieved amazing feats in the distant future of the Android universe, like an elevator stretching to the moon itself, there’s still a dark undercurrent to the world’s soul. Gangs run rampant, megacorporations skirt the law for a profit, and deep in the heart of the New Angeles undercity, evidence of a serial killer starts to mount. It will take the right kind of reporter to expose the dark corners of this city and shine a light on these mysterious killings. 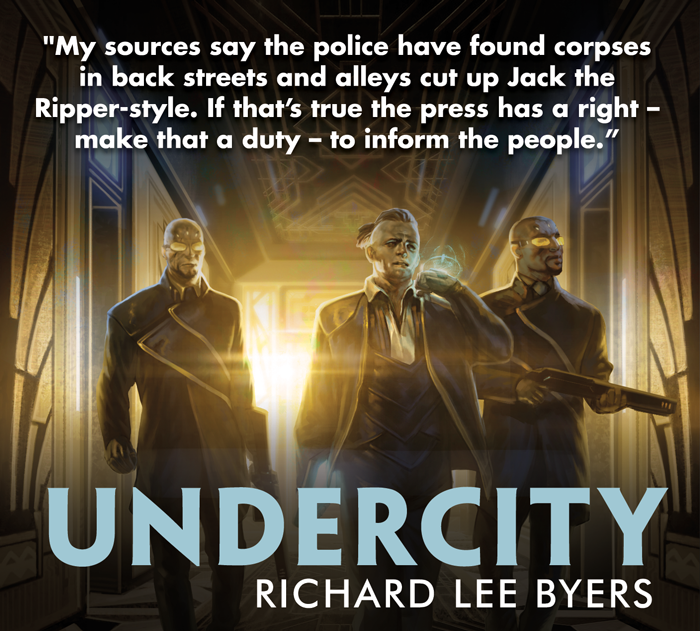 Fantasy Flight Games is proud to announce Undercity by Richard Lee Byers, a new novella set in the Android universe! 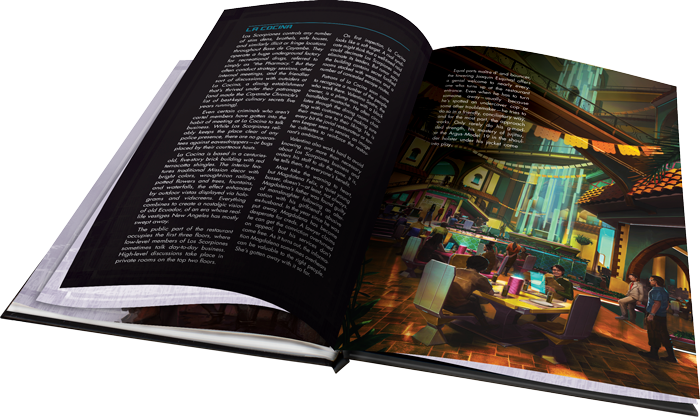 Undercity features a full 96-page story centered on Javier Zamora, a 16-page color insert detailing the treacherous Los Scorpiones gang, and exclusive content for Shadow of the Beanstalk, an Android sourcebook for the Genesys roleplaying system! Undercity is the newest novella set in the Android universe and explores the dangerous New Angeles undercity through the eyes of reporter Javier Zamora. Javier Zamora used to be a real journalist, with all the perks of working for NBN. Now, he vids scandalous, fringe, and downright disgusting content for a less mainstream corner of the Net. His stories draw an audience, enough to fund his life in the undercity. Or they used to, anyway. When Zamora stumbles on evidence of a serial killer stalking the undercity, he thinks it might be his ticket back to journalistic respect, or at least a steady revenue stream. But as the investigation draws him into a sordid world of underground cage fights and blackmail scams, the notorious Los Scorpiones gang warns him to drop the story. Launching alongside Undercity is Shadow of the Beanstalk, an Android sourcebook for the Genesys roleplaying system. After you've finished the story, Undercity's full-color insert invites you to sprinkle elements of the novella into your Shadow of the Beanstalk campaigns with two new adversaries, two new weapons, and two new pieces of gear related to the deadly Los Scorpiones gang. These elements are fully compatible with any campaign using the Genesys roleplaying system, but slot perfectly into an Android focused adventure. The Android universe invites you to view a dystopian future, where megacorporations run the world and everyone else just tries to scrape by in an ever-expanding urban sprawl. The undercity is the perfect hunting ground for a serial killer; can Javier expose the story with his life intact? Find out in this page-turning neo-noir adventure! Return to the Android universe with Undercity (NAD10), available now for pre-order from your local retailer or our website!